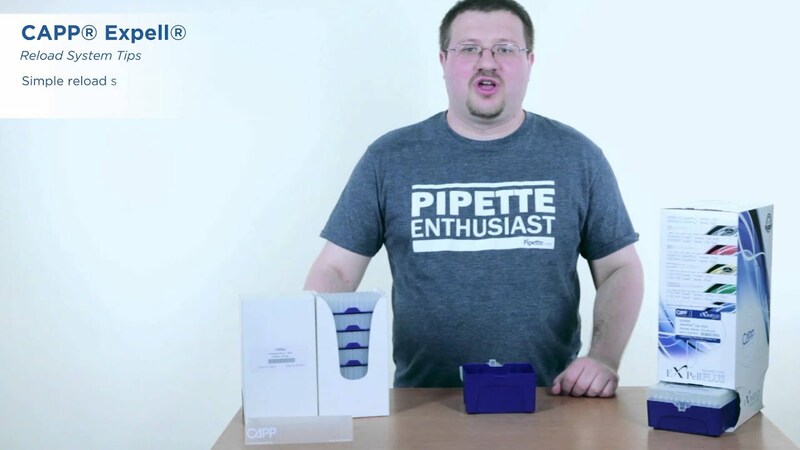 Racked Pipette Tips from Capp Denmark. Low Retention Tips. Manufactured on superb quality, Swiss made injection molds, both Expell and ExpellPlus racked pipette tips offer universal compatibility with great majority of pipette brands on the market. To support a wider range of applications, Capp tips are available in different lengths within the same volume range. Capp racked pipette tips come in autoclavable racks, packed in user friendly and space saving dispenser boxes (see picture below). Each box includes 10 racks (8 racks for 1mL tips). Made of virgin polypropylene, all Capp racked pipette tips are RNase, DNase and Pyrogen free certified. 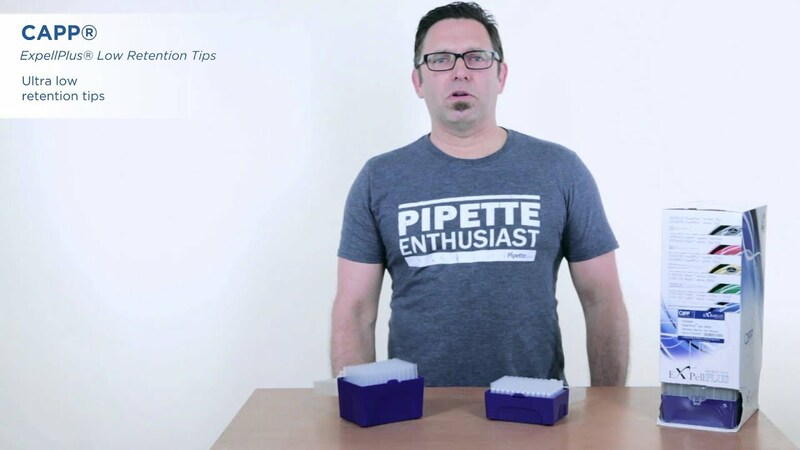 The ExpellPlus racked pipette tips have unique low retention properties, reducing sample binding to minimum and significantly improving your pipetting results. Available as filter and non-filter tips, in sterile and non-sterile versions or as a reload system. Contact us to receive free samples of Capp racked pipette tips. Expell 10µL, hinged racks, 5x10x96 pcs. ExpellPlus 10µL, pre-sterile, hinged racks, 5x10x96 pcs. Expell 10µl, pre-sterile w/ filter, hinged racks, 5x10x96 pcs. Expell 10µL XL, hinged racks, 5x10x96 pcs. Expell 10µL XL, Extra Narrow, hinged racks, 5x10x96 pcs. ExpellPlus 10µL XL, pre-sterile, hinged racks, 5x10x96 pcs. ExpellPlus 10µL XL, Extra Narrow, pre-sterile, hinged racks, 5x10x96 pcs. Expell 10µl XL, pre-sterile w/ filter, hinged racks, 5x10x96 pcs. Expell 20µl, pre-sterile w/ filter, hinged racks, 5x10x96 pcs. Expell 100µl, pre-sterile w/ filter, hinged racks, 5x10x96 pcs. Expell 200µL, hinged racks, 5x10x96 pcs. ExpellPlus 200µL, pre-sterile, hinged racks, 5x10x96 pcs. Expell 200µl, pre-sterile w/ filter, hinged racks, 5x10x96 pcs. Expell 300µL, hinged racks, 5x10x96 pcs. ExpellPlus 300µL, pre-sterile, hinged racks, 5x10x96 pcs. Expell 1000µL (1250µL), hinged racks, 4x8x96 pcs. Expell 1000µL (1250µL), pre-sterile, hinged racks, 4x8x96 pcs. Expell 1000µL (1250µL), pre-sterile w/ filter, hgd. rks.4x8x96 pc. Expell 1250µL XL, hinged racks, 4x8x96 pcs. Expell 1250µL XL, pre-sterile, hinged racks, 4x8x96 pcs. Expell 1250µL XL, pre-sterile w/filter, hinged racks, 4x8x96 pcs. Expell 5000µL, pre-sterile, racks, 10x50 pcs. Expell 10000µL, pre-sterile, racks, 10x25 pcs.